I loved our retractible laundry line so much I had to beg Stealthy Dad to install a second. They wrap around our deck, which is right outside the back door. 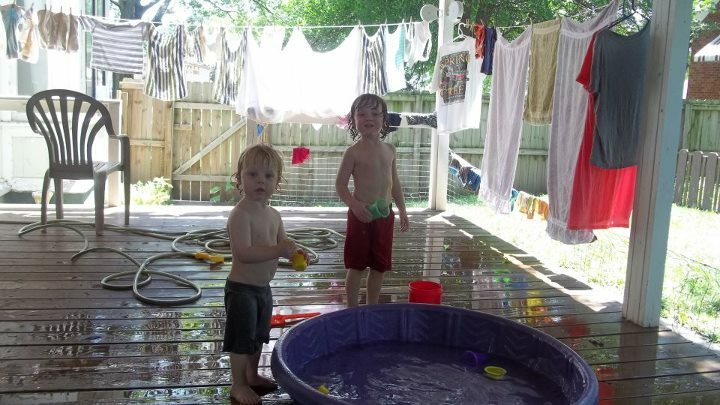 Our last home had a wire fence around the yard that I threw laundry on to dry. Why do I hang stuff outside when we own a dryer? To save money. It's a no-brainer that hanging laundry out saves on electricity since you don't have to run the dryer. Have you considered, though, the cost of cooling your home? A big hot box, no matter how well vented to the outside, will create ambient heat. The steam can be useful in the winter, but during the spring and summer your air conditioner will have to work extra hard to compensate. Sunlight bleaches without bleach. Whiten your whites and get the stains off the fronts of the kids' light-coloured shirts without damaging the fabric. Sunlight sanitizes. Diapers dried in the sun lose that mysterious funk. Towels become super-clean, no matter what they were used for. Dump your "air fresheners." Fabrics hold a lot of scent, good or bad, and a good line-dry works so much better than treating a room with a plug-in. Take the blankets and sheets off the beds and the throws off the couch. Wash them, dry them outside, then bring them in to notice the change in the room. I like to do this in the winter because it is like opening a window. Soften without softeners. I used to think that line-dried clothing had to be stiff and scratchy. You know what? I was using too much soap. Somewhere in the back I my mind I associated "bubbles" with "clean" and used far too much detergent to make that happen. Once I broke myself of that habit, I was amazed how soft our clothes could be. If your towels seem flat you can fluff them up for a few minutes with a tumble in the dryer without heat. Most of the time a good breeze will fluff everything up for you. It gets you outside. I was talking with a gal at the farmer's market last week who complained that she shrunk her jeans in the dryer. I asked if she's ever tried hanging them out, and she told me that would mean going outside. Huh. Isn't that the point?